The company is founded in 1971 when Jean-Claude Bélisle and his wife, Gemma Gagnon, buy an old mill in order to begin producing artisanal wooden doors and windows. 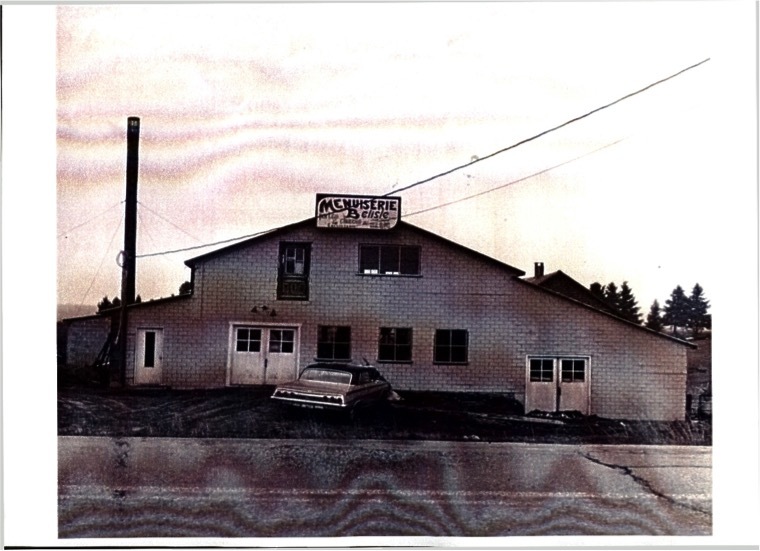 In 1977, the company opens a new division specializing in rafters and joists. 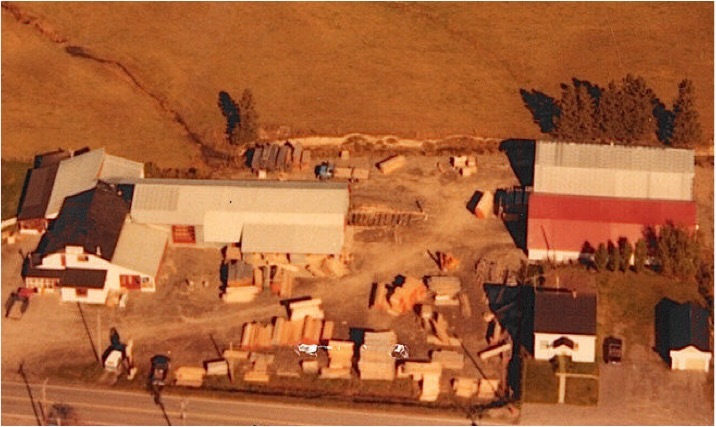 Rafter delivery in the 1970s. Jean-Claude Bélisle and his brother Richard design and manufacture specialized equipment. Early in the 1980s, Jean-Claude hires several members of his family who thus become the company’s employees. 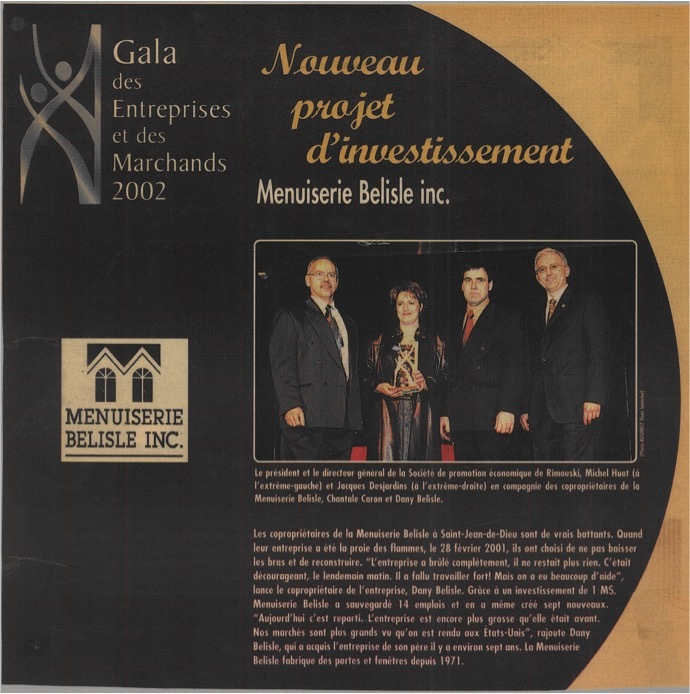 Menuiserie Bélisle’s customer base expands through the Canadian market. Its custom-made wooden doors and windows manufactured to the highest quality standards and the company’s emphasis on customer satisfaction help Menuiserie Bélisle stand out from the competition. The company continues to grow, acquiring expertise in handling highly complex projects such as the creation replicas of historic wooden doors and windows. 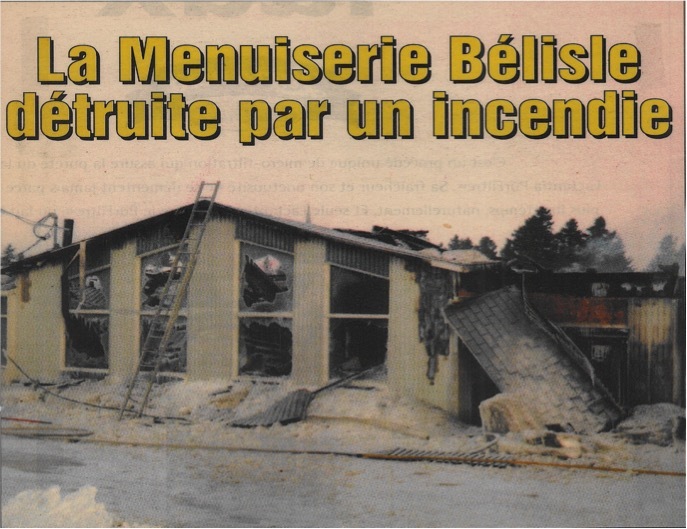 Menuiserie Bélisle in the late 1980s. 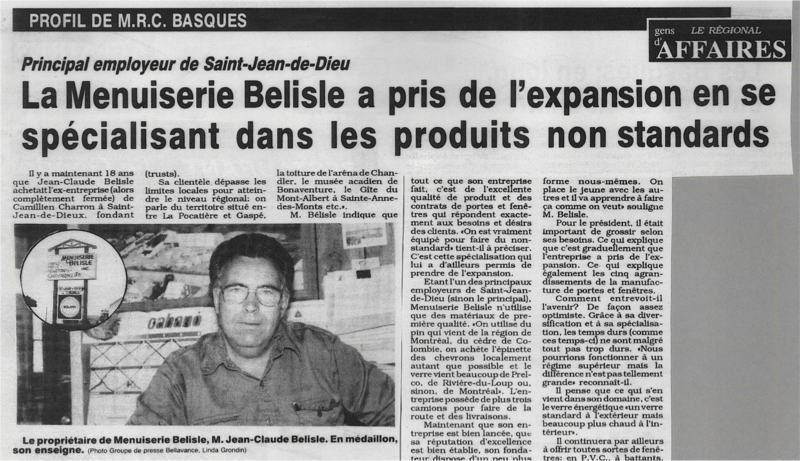 In 1991, Jean-Claude renovates the Menuiserie Bélisle facility. He diversifies the company’s window product lines and streamlines production to meet the demand for windows, doors and rafters. 1991 — Menuiserie Bélisle launches a full range of artisanal wooden doors and windows, including custom products, historical reproductions, single-, double- and triple-sash windows, sliding windows, picture windows, entry doors, French doors, hopper and awning windows, traditional casement windows, custom wooden garage doors, and more. 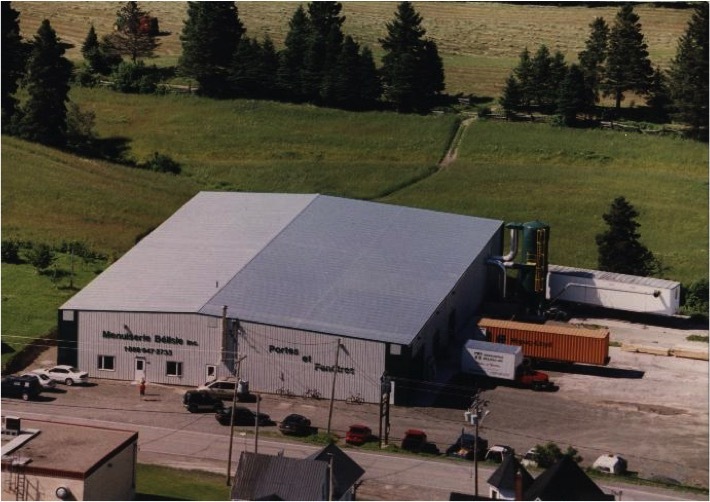 In early 1992, the company undertakes a major renovation to modernize its facilities, improving the factory, adding new machinery facilities, and inaugurating new offices and a new showroom. Menuiserie Bélisle thus becomes one of the largest manufacturers of doors and windows in the region. In the fall of 1992, Jean-Claude dies suddenly in an unfortunate accident. It is a huge loss for the family and the company. Dany Bélisle and his wife, Chantal Caron, agree to take over the family business. Dany becomes the president and CEO, and Chantal becomes the general manager and head of accounting. The new leadership team’s mission is to continue to grow the company. The rafter and joist division is closed. From this point forward, the company focuses entirely on developing a business devoted to manufacturing artisanal windows and doors. In addition, Dany and Chantal decide to begin exporting windows and doors to the U.S. market. Everything goes well and orders pour in. Early in the winter of 2001, a fire completely destroys the facilities. Dany and Chantal decide to rebuild the plant because the company’s order book is full and customers are counting on them. It is a difficult time for the company. To keep production going during the winter, Menuiserie Bélisle looks for a heated building that can accommodate the equipment and employees until new facilities can be built. The municipality of Saint-Jean-de-Dieu agrees to temporarily lease the municipal garages to the company. The new plant is built in the spring and inaugurated on August 25, 2001. As orders from the United States continue to pour in, Menuiserie Bélisle notices major growth in two market niches: windows for major historical sites and the high-end residential sector. To continue to meet demand, the facilities need to be expanded. Menuiserie Bélisle is able to successfully compete with the largest manufacturers of wooden doors and windows in the Canadian and American markets. The company develops a distribution network in Canada and the United States. Many new wood products are developed and tested in the factory. All Bélisle products are tested by an independent laboratory to obtain Energy Star certification. Wooden French doors and sliding patio doors. Wooden picture windows and window walls. Custom screens for all products. A new partnership is created to buy the family business from Dany and Chantal. The company is now run three partners: Jean-Pierre Bélisle, production manager; Michel Dumont, business manager, and Kevin Thibault, sales and engineering manager. 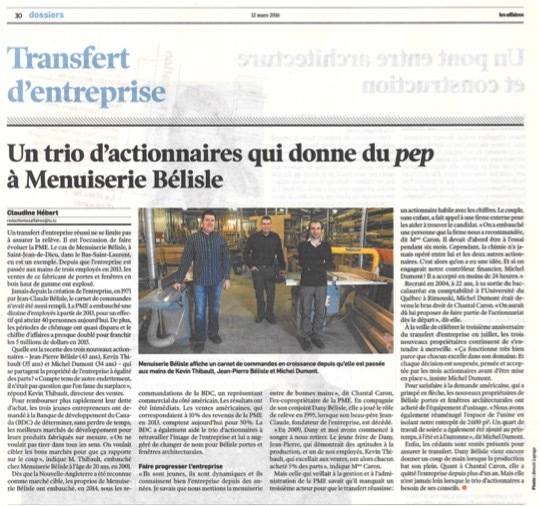 Menuiserie Bélisle carries out major renovations on its facilities and adds new equipment, notably a CNC machining centre. The company’s official logo and brand image are changed. The English brand name is now Belisle Architectural Windows and Doors. New equipment is added, including a four-sided digital planer, and an indoor wood storage system is installed. The finishing equipment is updated.